Teach your pet that silence is golden. If you find yourself wondering when you might get a decent night's sleep, enjoy a quiet afternoon, or be smiled at by your neighbour again, it's probably time to think about a bark control collar. The fact is, dogs bark. They do it when they're excited or when they sense danger. Some do it when they're bored - or worse, for no reason at all. In these cases, you want to teach your friend that barking is only permitted under certain circumstances. Our bark control collars are marvels of miniaturization and innovation. They monitor for your dog's bark and automatically let him know when he needs to be quiet. These remarkable collars can remove the strain that excessive barking has put on your relationship with your otherwise perfect pal. Find the right product for you in our ULTRASONIC, SPRAY, & STATIC ULTRASONIC range below. 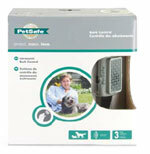 The PetSafe® Ultrasonic Bark Control effectively deters barking when it is worn. When the microphone picks up the sound of your dog’s bark, the unit emits an ultrasonic tone that can be heard by your dog, but is silent to most humans. Startled by the high-pitched tone, the dog shouldstop barking, as it will associate its bark with this unpleasant noise. • For dogs over 3.6 kg up to 13 kg and placid of nature. ULTRASONIC BARK CONTROL COLLAR - A well-timed tone can hush your puppy. This remarkably light, 28g. collar emits an unpleasant but harmless tone to correct your dog’s barking problem. The collar’s cutting-edge, bark-detection microphone can be adjusted to recognize your dog’s unique bark so that no other sound can set off the unit. This collar is most effective when used on small dogs. • Reacts only to the sound of barking. • Best used on small dogs. • Emits harmless, but effective sound to control excessive barking. OUTDOOR BARK CONTROL UNIT - Love thy neighbour by stopping his dog from barking. 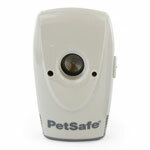 • Uses ultrasonic sound to deter nuisance barking. • Detects the sound of barking up to 15 metres away. 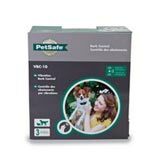 • Safe and effective for all small to medium, placid breeds of dogs. • 3 levels of operation. The Anti-Bark Spray Collar™ conditions your dog to stop barking. It is completely harmless and has no secondary effects. Research shows that the Anti-Bark Spray Collar™ will reduce nuisance barking by up to 88%. Unscented Refills are also available. This simple, easy-to-use collar teaches your dog to stop his annoying barking. His bark automatically activates a quick unscented spray, surprising him and breaking his cycle of barking. Only his bark triggers a correction - great for multi-dog homes. No external controls or settings to configure - training your dog couldn't be easier. This smallest bark collar currently on the market. For small dogs up to 26 kg. Our Citronella Spray Refill works with all PetSafe® Spray products including Bark Control and Remote Training. Our Unscented Spray Refill works with all PetSafe® and Spray products including Bark Control and Remote Training. First, it offers 10 combinations of Vibration Stimulation. When the dog barks, vibration is delivered from one of the two Vibration Points. The duration of the vibration is random, which interrupts the dog’s bark. When used according to instruction, the Vibration Bark Control Collar safely reduces (and in most cases eliminates) nuisance barking. Second, the Vibration Bark Control Collar includes Patented Perfect Bark™ technology. It uses both vibration and sound sensors (dual-detection) to discriminate each bark from other external noises. This ensures your dog’s bark is the only sound that will cause the stimulation. STANDARD BARK CONTROL COLLAR - Are you ready to experience ''quiet'' again? This best-selling, lightweight collar uses a simple vibration sensor to detect your dog’s barking. The safe and gentle stimulation level automatically increases through 6 levels if your pal’s barking continues. He'll quickly learn the association and stop the unwanted behaviour. • 6 Progressive levels of correction which adjusts automatically. • Suitable for dogs > 3.6kg. 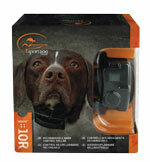 DELUXE BARK CONTROL COLLAR - Stop his barking, but honour his personality. Dogs have different temperaments. This innovative collar has three correction modes, each with six levels of stimulation, so you can fine tune according to the unique needs of your furry pal. If you choose, correction levels can also be set to automatically increase after each subsequent bark. Patented Perfect Bark™ technology ensures that your dog’s bark is the only stimulus to trigger the correction. The PetSafe® Deluxe Anti-Bark Collar has two primary features designed to shorten the training phase and promote good behaviour. First, the Deluxe Anti-Bark Collar has a unique patented sensor that provides the most reliable bark detection available. The Deluxe Anti-Bark Collar uses both vibration and sound sensors (dual-detection) to discriminate each bark from other external noises. An electrical stimulation is administered through the Contact Points only if both the vibration from the vocal chords and the sound from the bark match the same criteria. Second, the Deluxe Anti-Bark Collar has a patent pending Temperament Learning System design that is effective across many dog breeds and their individual barking behaviours. The Temperament Learning System contains software that tracks the number of stimulation instances needed to substantially reduce (and in most cases eliminate) the number of nuisance barks. The system has 10 levels of electrical stimulation. It begins with low-level corrections, however, if excessive barking continues the correction intensity will increase with each successive bark until the barking stops. Once the dog has learned to reduce the barking, the initial warning stimulations are reduced. As a built-in safety feature, if your dog barks 15 times or more within a 1 minute 20 second period, the Deluxe Anti-Bark Collar will automatically shut off for 3 minutes.